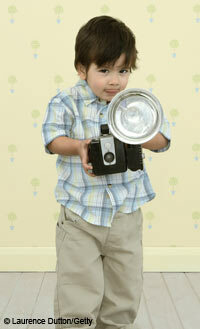 As children are naturally curious, they learn best through a variety of practical activities. Exploring objects from the past will involve them in using all of their senses, as well as discussing the age of the objects. A collection of old objects is a good way to encourage children to find out about the past. Using artefacts of this kind will also introduce the children to a wide range of materials and resources – natural and made – which will encourage them to look closely, examine and explore them and ask questions. It is important that the children are able to fully participate when exploring the resources, so any items should not be too precious or fragile and must be assessed for health and safety implications, so that the children can handle them in a relaxed atmosphere. Pictorial history books of your area can be used to good effect. Although young children will not understand exactly how long ago the photographs were taken, they can still be used to help them see differences from a time past and how we live now. Children’s picture books often depict different eras, and these will involve the children in observing how some things have changed over time. Any objects that can be handled by the children and are old enough for them to notice a difference; objects that can be easily found in charity shops or provided by parents or grandparents, for example, old coins, vintage clothes, records and record players, typewriters, cameras, household items such as flat irons, maps, books, bottles and toys; discovery table. Development matters: build up vocabulary that reflects the breadth of their experiences; extend vocabulary, especially by grouping and naming (40-60+ months).